One of the central questions for lawmakers looking to reform the federal tax code this year is how to address the $2.5 trillion in earnings that U.S. companies are holding offshore to avoid taxes. Lawmakers on both sides of the aisle have supported proposals that would either require or allow companies to repatriate these earnings to the United States at a discounted tax rate. These proposals have ranged from letting companies repatriate their earnings tax-free to requiring them to immediately pay a discounted rate of 20 percent. All of the proposals would give corporations a substantial tax discount and forego much-needed revenue. President-elect Donald Trump’s proposal falls in the middle of the spectrum. His plan would require companies to repatriate their earnings at a 10 percent tax rate, which represents a 70 percent discount from the current 35 percent rate. This proposal would allow U.S. companies to collectively pay an estimated $206 billion in taxes on their $2.5 trillion in offshore earnings, rather than the roughly $720 billion that they would owe if these earnings were subject to the statutory corporate tax rate. In other words, Trump’s proposal would give U.S. companies a tax break of up to $514 billion. Corporate tax reform that addresses offshore cash is not a certainty, and there is no way to determine what a final proposal will look like once a bill makes its way through the legislative process. But we can evaluate the details of each proposal and, based on corporate filings, roughly ascertain how much and which corporations would benefit. 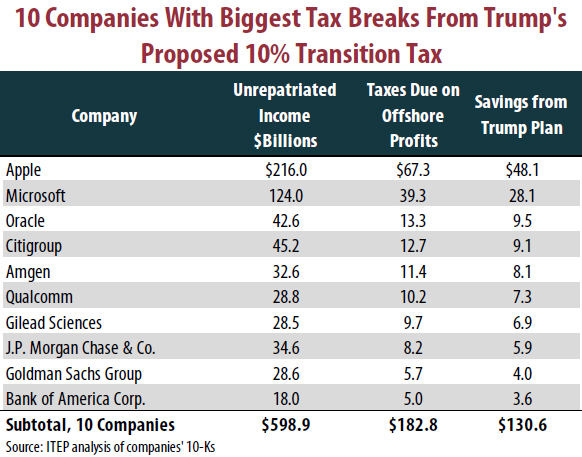 Because Trump’s proposal falls in the middle of the spectrum and obviously would have backing from the administration, ITEP analysts examined how much companies would save in taxes based on Trump’s 10 percent proposal. The few companies that would benefit most from a low-rate deemed repatriation have been most aggressive in their use of offshore tax avoidance schemes. These estimates are based on companies’ revealing how much they would owe in taxes upon full repatriation of their earnings. The biggest beneficiary of Trump’s deemed repatriation proposal would be Apple, the company now most notorious for its international tax avoidance. Under current rules, Apple should pay $67.3 billion in taxes when its $216 billion in earnings being held offshore are repatriated. This calculation is based on the estimated 3.8 percent tax rate the company has paid to other governments on its offshore earnings. The statutory corporate income tax rate is 35 percent, and the corporate tax code reduces that rate based on the percent already paid. So under current law, Apple would be subject to a 31.2 percent tax on these earnings upon repatriation. In contrast, a deemed repatriation of 10 percent would allow the company to pay just $19.2 billion, representing a $48.1 billion tax break compared to the $67.3 billion it would otherwise owe. Microsoft would save an estimated $28.1 billion on its $124 billion offshore earnings, making it the second biggest known potential beneficiary of Trump’s repatriation proposal. Some of the nation’s largest financial companies would also benefit handsomely from the Trump plan. Citigroup would enjoy a $9.1 billion tax cut, while JP Morgan Chase would see a $5.9 billion tax break. Goldman Sachs and Bank of America would receive tax breaks of $4 billion and $3.6 billion, respectively. Rather than allowing corporations to receive a substantial tax break on their offshore earnings, lawmakers should require that these companies immediately pay the full 35 percent (minus foreign tax credits) that they owe. Many companies not engaged in offshore tax avoidance routinely pay the full rate. Further, it should be noted that a significant portion of these offshore earnings represent U.S. earnings that have been shifted offshore using accounting gimmicks. Besides restoring fairness to the corporate tax code, requiring companies to pay the statutory corporate tax rate on their offshore earnings would have the added benefit of raising substantially more needed revenue. As noted above, requiring companies to pay the full rate that they owe would raise around $720 billion in much-needed revenue, which is several times the $206 billion yield of a 10 percent deemed repatriation. This additional revenue would be much more useful to the country if it were used to pay for critical public investments, rather than squandered to pay for a tax rate cut that will have the effect of further subsidizing corporations’ already high profits.